To send e-mail from a PHP application using the System.Net.Mail API, you must configure Simple Mail Transfer Protocol (SMTP) e-mail. Configuring e-mail services tells the System.Net.Mail application programming interface (API) to which SMTP server to deliver the e-mail generated by your application. Mail can be delivered immediately, or it can be delivered to a file location on disk where it can be retrieved for delivery later. For example, a company can provide an e-mail link for sending feedback messages or for requesting information. The SMTP server is not installed by default. Under Features, select Add Features. Select the SMTP Server check box. Click Add Required Role Services. 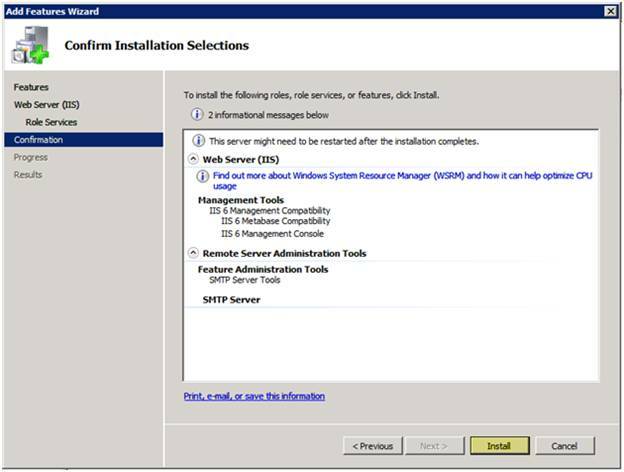 If there are any missing roles required for the SMTP installation, Windows Server® 2008 R2 or Windows Server® 2008 installs them. Click Next. You need to step through the entire wizard again, even though IIS is already installed (IIS 6 Management Compatibility and the IIS 6 Management Console must be installed for SMTP to work). Press Close when installation is complete. Once you add SMTP, you can configure it for your PHP applications. This can be done by using the user interface (UI), by running Appcmd.exe commands from a command prompt, by editing configuration files directly, or by writing Windows® Management Instrumentation (WMI) scripts. Note that you must have IIS installed before enabling SMTP. Open Internet Information Services (IIS) Manager, and then navigate to the level you want to manage. Features View, double-click SMTP E-mail. Deliver e-mail to SMTP server: to deliver e-mail messages immediately. This requires an operational SMTP server for which the user has credentials. Store e-mail in pickup directory: to store e-mails in a file location on disk for later delivery by the PHP application (or by a Microsoft® ASP.NET application or by a user). Type the unique name of your SMTP server in the SMTP Server text box, or select the Use localhost check box to set the name to LocalHost. Setting the name to LocalHost means that ASP.NET uses an SMTP server on the local computer. Typically, this is the default SMTP virtual server. You can configure IIS so that e-mail is delivered immediately or stored for later delivery. The variable fromstring is the e-mail address of the sender. 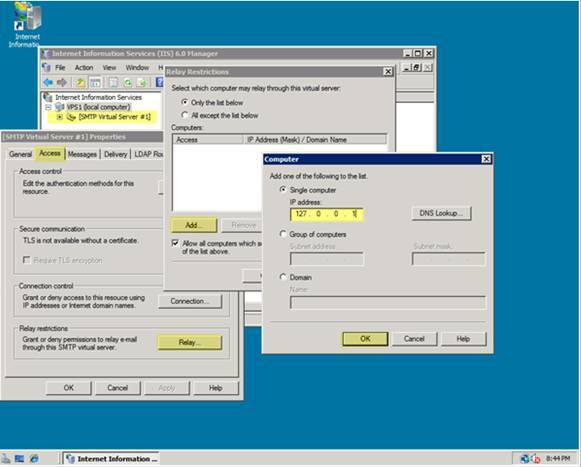 The variable /deliveryMethod:network configures IIS to deliver e-mail messages immediately. The variable /network.portint sets the TCP port that is used by IIS to deliver e-mail messages. The variable /network.hoststring specifies the host used for SMTP transactions. The variable network.defaultCredentials:True|False enables or disables authentication using the default network credentials. If defaultCredentials is set to True, Kerberos or NTLM are used if the server supports these protocols. The variables network.userName: string and network. password: string set a basic authentication user name and password. The variable from string is the e-mail address of the sender. The variable/deliveryMethod:PickupDirectoryFromIis|SpecifiedPickupDirectory string configures IIS to store e-mails in a file location on disk for later delivery. The variable /SpecifiedPickupDirectory string sets the file location on disk in which to store the e-mail messages for later delivery. Note that when you use Appcmd.exe to configure the <mailSettings> element at the global level in IIS, you must specify /commit:WEBROOT in the command so that configuration changes are made to the root Web.config file instead of the ApplicationHost.config file. Note that the default value is localhost, so there is no need to change this if SMTP is installed locally. Right-click on Default SMTP Virtual Server. On the Properties page, open the Access tab, and then click on Connection. You can see which server or IP addresses are allowed to connect to the server. If the IP address 127.0.0.1 is not listed, add it using the Add button. You may also add your server IP address to the list. Click OK to accept the information. Click the Relay button on the Access tab, and set up the relay options for the server. Ensure that localhost and the IP address 127.0.0.1 are granted permission to relay mail. Click OK to accept the options, and then click Apply and OK to return to the main page of the IIS Manager. Create a test script to see whether you can send e-mail using PHP. Copy the following text and save it as email_test.php at your server root. Run the file at mydomain.com/email_test.php. Configure SMTP e-mail in IIS 7.